On Friday, September 22, sushi became available at the Cutler Commons (where Read Between the Grinds is located) for a meal swipe for the first time this semester. If you decided to eat a late lunch, you would have never realized. The shelves were stocked by 11 a.m. and in less than an hour, the 75 to 80 pieces had all been sold, according to Shane Powers, the marketing specialist for Albion College’s Bon Appetit. In the days since, demand has remained strong. Currently, the college is waiting on certifications to be allowed to prepare and serve raw fish. Until they have received approval, about 40 different kinds of sushi are being trucked in, including vegetarian options. “Right now we’re waiting on the Department of Agriculture to come in and give us the certification, so we’re having it made at Sushi Kabar’s location in Marshall. They’re making it fresh there and delivering it every day. Actually, they’re making two deliveries a day because the demand is so high,” said Powers. Monday through Friday, sushi is available beginning at 11 a.m. and going until 8 p.m., but the supply hasn’t been making it until the evening. 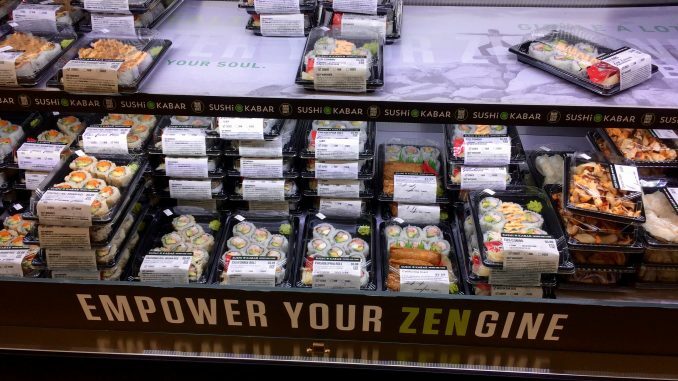 Ideally once sushi is being made on campus, it will be easier to keep up with the demand. Powers said that once the Department of Agriculture gives Albion their certification to make sushi, it will be produced in Baldwin each morning by two sushi chefs. While the details of having sushi made at Albion are still being worked out, for now there is a plan in place to try and satiate the students need for sushi. “Our main goal was to make sure you guys were going to get the sushi, like we said we were going to do, and we want to make sure you guys are taken care of,” said Powers.